After Christmas, we moved on to redecorating the kids’ rooms. I’m really proud of how these turned out because my budget was tiny and it was all DIY. I repurposed furniture from all over the house and spray or chalk painted EVERYTHING! We kept the old carpet because, even though it’s old and has plenty of stains, they are KIDS. And kids stain carpet. 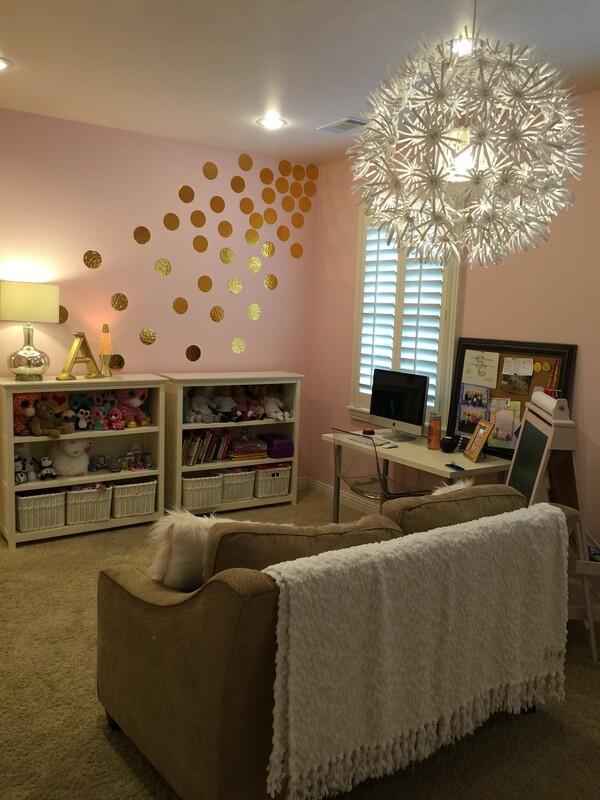 Kate turns 13 this summer, and it was time for her to update to a more grown up room. We chalk painted her original bed (it was cherry color wood), desk, and side tables. We moved in some gray chairs from the living room to create a sitting area. We used gold spray paint to change the look of the round light, which was in the hearth room. The lamps were originally clear and we painted those, too, along with a bunch of picture frames and a wooden monogram. 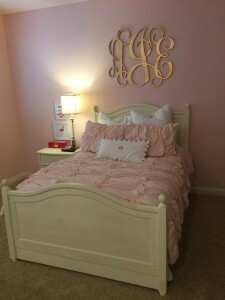 Abby’s room was a little bit more challenging, because she wanted all pink, but she didn’t want it to look like a baby room (she’s 10). 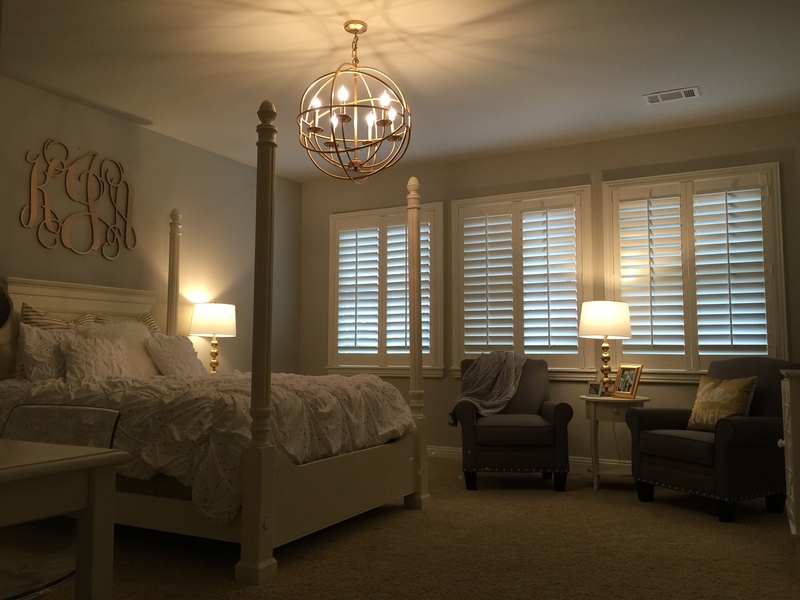 She spent a lot of time on Pinterest getting ideas, and was pretty specific on how she wanted every inch of her room. 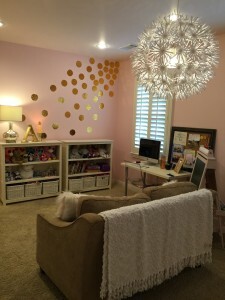 Gold and pink, flamingos, gold polka dots. We painted her black bed and nightstand with chalk paint and painted the ceiling a lighter pink than the walls to tone down the Pepto Bismol effect (as I named it). She got a gold monogram, too. I love how those look! Her room is long and narrow, so she has a good place for reading. We moved the loveseat from the hearth room up to her room to create a seating area. She still needs a lot of storage for toys and dolls, so we moved a shelf from Kate’s room in to give her more space. Alex’s room was the most simple because he didn’t care. At all. He’s a typical 8 year old boy. 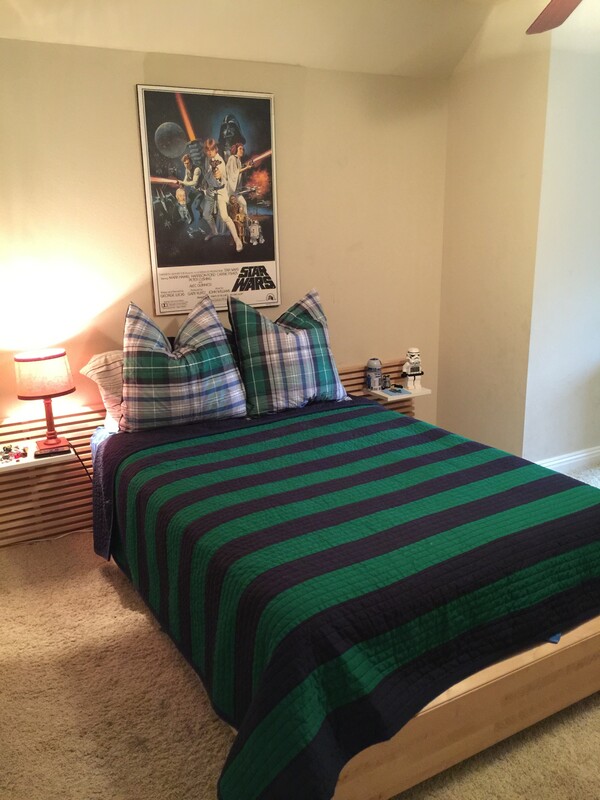 So we kept his old IKEA furniture, but got a new bedspread. Pottery Barn clearance. Same Star Wars art. Copyright © 2016 Our Everyday Dinners - This is an easy recipe for how to make #JamesRemodel2016 Part 2.